This indicator is a kind of a tester. It is designed for those who differentiate their portfolio using different currency pairs or who is using multi-currency strategies. The indicator shows how the portfolio's profit or loss has change over a selected time period. The indicator gives an idea of ​​the possible risk in terms of money, time spent in profitable and unprofitable areas. 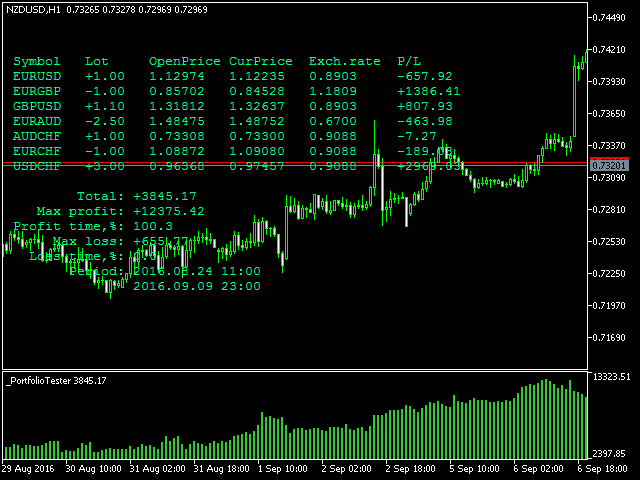 The indicator can analyze up to 10 any (except metals) virtual pairs provided by a broker. LookBack - the number of history bars and the time interval within which the indicator should calculate the total profit or loss. At the opening of this bar, the indicator opens all virtual pairs. Pair - the variable determines the currency pair. Lot - determines lot value and trade direction. "+" for Buy, "-" for Sell. The result of calculation of profit or loss is taken simultaneously for all currency pairs and is reflected as a histogram in the currency of the platform. the list of all pairs with open prices, conversion rate to the platform currency and current profit or loss. One of the useful properties of the indicator is the ability to visually analyze where the portfolio is moving - towards profit or loss, and make decisions on this basis.